Rebranding is a fine balancing act. Not destroying the image that has been attached to a product’s success, you must retain enough of the original message, while updating the look to a more modern version. Arbi Arzoumani did a wonderful job with php|architect’s image (logos, colors and fonts as well as magazine, conference and website design). I’ve always admired what he did with the brand, especially since he wore so many hats at BP. He was actually in the process of a brand update when musketeers took over. He updated the logo to a more minimalist version; ditching the outlined “A” logo mark for a flat, white solid “A” on a field of orange (which made it’s first appearance on the June 2012 php|architect magazine cover). Taking his direction further, I simplified the whole image (logo, fonts and colors) to a more colorful and less cluttered version. I also decided to unify the brand across all product lines, including the magazine, websites, books, summits and conferences. I’m using the lessons learned from UX design in usability, that the interface should never get in the way of the content. In designing for content, design should be there to enhance the communication of message, not be the message. Broad fields of color will be used as headers, covers and intro pages. Use of white space will be liberal, giving the eye needed rest (reading commentary and scouring code samples). For the central font, I chose to bring Gibson over from our mojoLive past. It’s a sans-serif font that can be used to convey elegance and authority as well as quirkiness. The tech sector has been buzzing this week about Apple’s new-found embracing of minimalism. 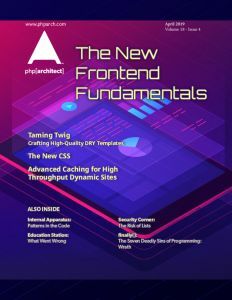 It’s not strange, as many of us tech-minded designers tend to follow the Bauhaus ethos of “form follows function” and “less is more.” Whether or not it was a good move for Apple, it’s a good move for php[architect]. We have just started this process of gradual update, starting with the magazine and now including the website(s). Soon to follow are the books (as the are released) and the conferences. Kevin is the sole Designer/Front End Developer in the band of developers called musketeers.me. He has spent half of his 20 year design career drifting between Web Designer and Developer and lives in both camps comfortably. Being an evangelist of clean design and clean code, he runs a local design meetup and speaks at national tech conferences. please reconsider the orange tone. On a wide gamut monitor the color really screams at you and distracts from the content.